Kale is everywhere and not our choice to put in a smoothie, but absolutely delicious when smothered with cheese sauce. Put a large pan of water onto a high heat, add a tsp of salt and bring to the boil. Tip in the kale and cook for a couple of minutes or until almost tender. When it has cooled a bit squeeze the leaves with your hands to remove excess water and spread out in an ovenproof dish (20 x 25cm). To make the cheese sauce, melt the butter in a saucepan over a medium heat, add the flour and cook for a minute or until bubbling. Gradually add the milk, whisking or stirring all the time, then reduce the heat and cook for 3-4 minutes or until thickened. Remove the sauce from the heat, add half the cheese and season with salt and pepper. Pour the cheese sauce over the kale and sprinkle over the rest of the cheese, then bake for 15-20 minutes or until golden and bubbling. We’re still waiting on spring veg to arrive in Ireland but we’re comforting ourselves with the old root veggies. We love the earthiness that celeriac brings to lamb cutlets and kale or lighter dishes like seared scallops. Wine Suggestion: You could try a New World Pinot from a cooler climate, like New Zealand, balancing not too much weight with a joyful fruit and freshness that works with the lamb and creamy celeriac. Peel and cut the celeriac into 5 cm chunks. Submerge in cold water acidulated with some juice from the lemon. Peel and cut the potatoes into chunks the same size as the celeriac and put into a small saucepan. Cover with salted water, bring to the boil, then simmer for about 15 minutes, or until tender. Drain the celeriac chunks and put in a separate saucepan, cover with salted water, add a little lemon juice and bring to the boil. Reduce the heat and simmer until tender – it will take longer than the potato. When the vegetables are soft, drain them well and allow to steam-dry in colanders for a few minutes. Mash the potato using a potato ricer or push it through a sieve. Mash the celeriac either with a potato ricer or by blending in a food processor. Combine both vegetables in a clean saucepan. Put the pan over a gentle heat and stir in the cream and milk. Stir in the butter, season well with salt and pepper and serve. 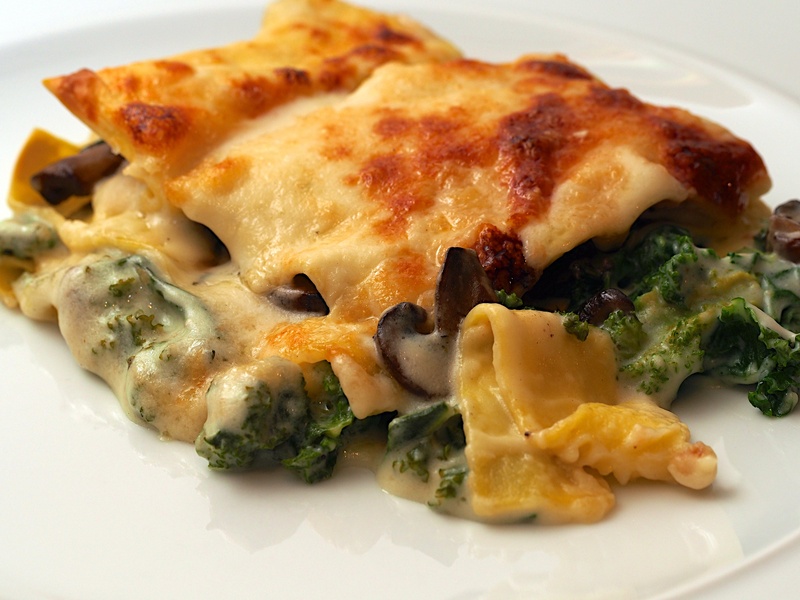 This is a really good veggie lasagne filled with curly kale and garlicky mushrooms – delicious! 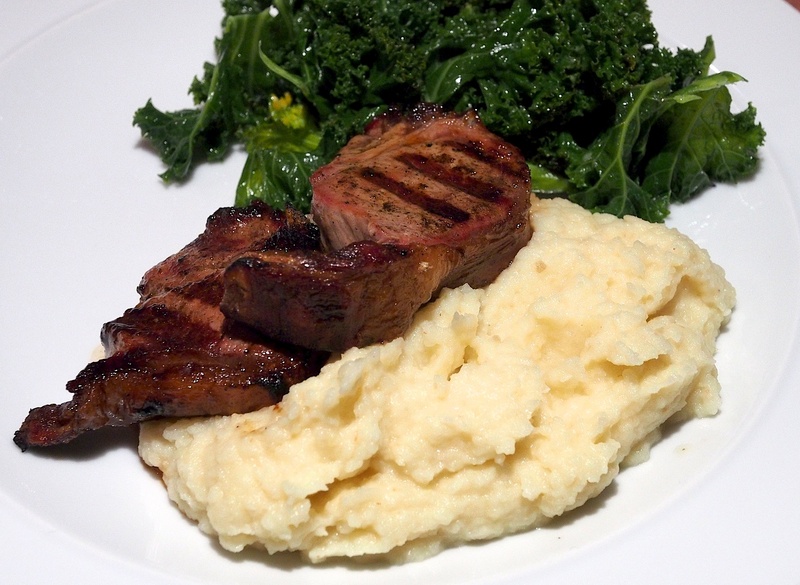 It is also much easier to put together than the usual meaty version and tastes much more luxurious. Heat the oven to 180°C/Gas Mark 4. Heat the milk with the bay leaf, onion, celery and peppercorns until almost simmering. Take off the heat and leave aside to infuse. Roughly shred the kale. Put into a large saucepan and just cover with cold water. Add salt. Bring to the boil, reduce the heat and simmer for a few minutes, or until just tender. Drain well and set aside. Heat half the butter in a large frying pan over a medium heat. Add half the mushrooms and season. Increase the heat and fry, stirring, until the liquid released has evaporated and the mushrooms are starting to brown and caramelise. Stir in half the garlic and half the thyme, cook for another minute, then remove to a bowl. Repeat with the rest of the mushrooms, garlic and thyme and set aside. Gently reheat the milk, then strain. Heat the butter for the béchamel in a large saucepan. Stir in the flour and cook gently for a couple of minutes. Take off the heat. Add about a quarter of the hot milk and beat vigorously until smooth. Add the rest of the milk in about 3 batches, until you have a smooth sauce. Put the pan back on the heat and cook for a few minutes, stirring and allowing the sauce to bubble gently, until thickened. Stir in the mustard, then season well. Stir roughly half of the béchamel sauce into the kale. Spread half the remaining sauce over the bottom of an ovenproof dish (approx. 28 x 22cm). Layer a third of the lasagne sheets in the dish, then spoon the kale over the top. Add another layer of lasagne, then add the mushrooms,. Finish with a final layer of pasta and the rest of the sauce. Scatter the cheese over the top and add a trickle of oil. Bake for about 30 minutes until golden. Serve right away. Wine Suggestion: We went for a red Burgundy from a lesser appellation (Santenay) in Burgundy with five years of age. It had a delightful earthiness and red forest fruit character which really complemented the flavours of the mushroom and kale. A much needed healthy dinner – we’ve been eating lots of meat and rich sauces recently and have more of the same planned for the weekend. Try this with a hunk of bread to mop your plate. Really easy and tasty but don’t forget to season! Heat 1 tbsp olive oil in a large frying pan and add the fennel. Cook for about 5 minutes, until softened. Add the garlic and paprika and fry for another minute before adding the tomatoes. Turn up the heat and cook for 5 minutes, until thickened. 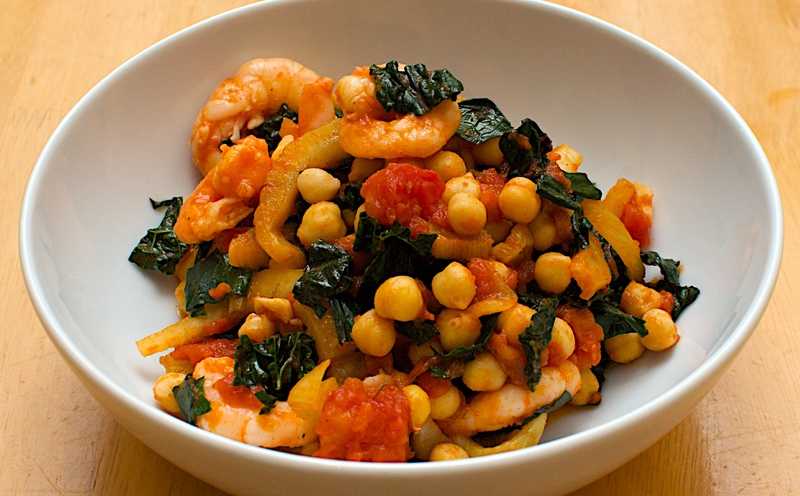 Stir in the chickpeas, chopped greens, seasoning and a splash of water and cook for 2 minutes. Add the prawns and cook until just pink.